Archives : 2010 - A YEAR OF POSITIVE CONSOLIDATION - 31/12/2010. 2010 – A YEAR OF POSITIVE CONSOLIDATION - 31/12/2010. Wish You All A Very Happy & Prosperous New Year 2011. PREVIOUS TOP TO BE TESTED. Finally the market managed to close above the 50dma and turn both the short and medium term trend to positive. Besides this, the market also managed to close above the intermittent high of Sensex – 20217 and Nifty – 6069 and also above the 61.8% retracement level of the recent fall. This signals that the market is on its way to test the previous high of Sensex 21108 and Nifty 6338. 2010 – ALLS WELL THAT ENDS WELL. If one has to sum up the past year 2010, then it was a year of positive consolidation. Nifty started the year around 5200 and posted a gain of around 20% on a year to year basis. But a major part of the last year was spent in sideways trend as the Nifty struggled to break the trading range. Nifty traded in a range of 4800 to 5400 for a major part of the last year. But the market started a strong upmove since September after breaching the trading range and as a result the Nifty saw an almost vertical rise from 5500 to 6300. Post Deepawali, Nifty again entered a corrective phase which saw Nifty going back to test the support at 5700 levels. But the year ended on a positive note as the Nifty managed to close above the 6100 mark and Sensex well above 20500. 2011 – YEAR OF EXPECTATIONS. The strong closing of the year 2010 raises hope for a strong performance in the year 2011. 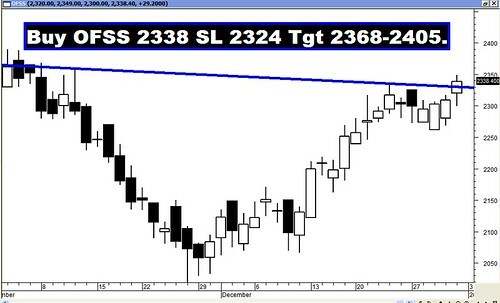 The chart pattern suggests an initial target of 23700 for the Sensex and 6800 for the Nifty. If we consider the entire Inverted Head and Shoulders pattern formation on the weekly charts, then the target for the Sensex will be at 27773 and Nifty 8344. Major support for the market will be at Sensex 18954-17819 and for the Nifty at 5690-5348. Infrastructure stocks and Capital Goods have been underperformers in this rally, but may be 2011 will be them outperform in percentage terms. The Sensex opened the week at 20062, made a high of 20552, a low of 19981 and closed the week at 20509. The Sensex thus gained 436 points on a weekly basis. Similarly Nifty opened the week at 6013, made a high of 6147, a low of 5982 and closed the week at 6134. The Nifty too closed with a gain of 123 points on a weekly basis. With this weeks white candle, both the indices have formed a Bullish Reversal pattern called Three White Soldiers on the weekly charts. This is a strong reversal pattern suggesting that the trend has reversed from down to up. On the daily charts, both the indices have formed an Opening White Marubuzo. If we consider last three days, then it is again Three White Soldiers, but the only difference is that this bullish pattern has been formed in an uptrend and hence will act more as a continuation of the uptrend. It will not be very surprising to see market consolidate for a while, after such a strong upmove. The market has now conquered the 50dma (Sensex – 20039 and Nifty – 6018) and as a result the medium term trend has also turned up in line with the short and long term trend. The short term trend was already up as the market was above the 20dma (Sensex – 19928 and Nifty – 5969). The long term trend was never threatened as both the indices were always above the 200dma (Sensex – 18568 and Nifty – 5573). Both Sensex and Nifty have closed above their 61.8% retracement level (Sensex – 20285 and Nifty – 6090) of the recent fall from 21108 to 18954 for the Sensex and Nifty 6338 to 5690. This signals a resumption of the uptrend and a possible move towards the testing of previous high (Sensex 21108 and Nifty 6338). Besides crossing the 61.8% retracement mark, both the indices have also managed a close above the intermittent high which was 20217 for the Sensex and 6069 for the Nifty. Since both Sensex and Nifty managed a close above the intermittent high, the path has been cleared for a retest of the previous high. Both Sensex and Nifty have formed a Flag formation and a breakout has also occurred and as a result the target for the Sensex will be 21058-21256 and Nifty 6284-6338. Majority of the oscillators are in Buy mode. MACD and ROC continue to be in buy mode while being in the positive territory. The RSI too is moving up and is at 62 signaling strong momentum ahead. Money Flow Index is moving higher and is at 71 suggesting that money is flowing in the system. OBV has also just given a Buy signal while moving higher. The Stochastic Oscillator is overbought as both %K and %D are in overbought zone. The ADX is at 19, suggesting that the trend is weak but the Directional Indicators have given a Buy signal as +DI has crossed –DI from below. The O.I. PCR is going strong at 1.61. The surge in the market has added to the confidence of the Put writers and as a result the OI PCR has increased. For the January series, there is a very strong build up in the 6000 Put and 6300 Call. 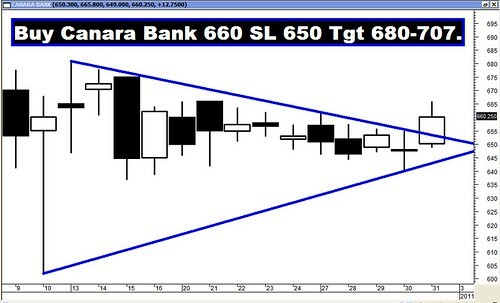 This suggests that the market is ready to move in a range of 6300 on the higher side and 6000 on the lower side. 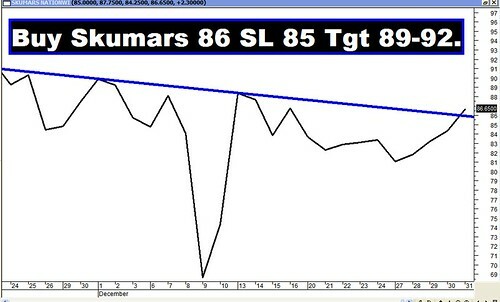 The Trendline Support for the Sensex is at 20179 and for the Nifty 6036. For the week ahead, Sensex will find Support at 20267-20032-19864 and will find Resistance at 20706-20917-21108. For the week ahead, Nifty will find Support at 6073-6011-5937 and will find Resistance at 6187-6243-6303. LAST WEEKS RECOMMENDATIONS: Almost all the recommendations reached their targets except for Jubiliant Food.